Heraclea Pontica (/ˌhɛrəˈkliːə ˈpɒntɪkə/; Greek: Ἡράκλεια Ποντική, translit. 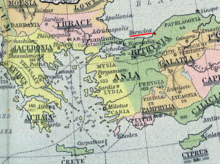 Hērakleia Pontikē), in Byzantine and later times known as Pontoheraclea (Greek: Ποντοηράκλεια, translit. Pontohērakleia), was an ancient city on the coast of Bithynia in Asia Minor, at the mouth of the river Lycus. It was founded by the Greek city-state of Megara in approximately 560–558 and was named after Heracles whom the Greeks believed entered the underworld at a cave on the adjoining Archerusian promontory (Cape Baba). The site is now the location of the modern city Karadeniz Ereğli, in the Zonguldak Province of Turkey. The colonists soon subjugated the native Mariandynians but agreed to terms that none of the latter, now helot-like serfs, be sold into slavery outside their homeland. Prospering from the rich, fertile adjacent lands and the sea-fisheries of its natural harbor, Heraclea soon extended its control along the coast as far east as Cytorus (Gideros, near Cide), eventually establishing Black Sea colonies of its own (Cytorus, Callatis and Chersonesus). The prosperity of the city, rudely shaken by the Galatians and the Bithynians, was utterly destroyed in the Mithridatic Wars. It was the birthplace of the philosopher Heraclides Ponticus. The Greek historical author Memnon of Heraclea (fl. 1st century AD) wrote a local history of Heraclea Pontica in at least sixteen books. The work has perished, but Photius's Bibliotheca preserves a compressed account of books 9–16, seemingly the only ones extant in his day. These books run from the rule of the tyrant Clearchus (c. 364–353 BC) to the later years of Julius Caesar (c. 40 BC) and contain many colorful accounts including the Bithynian introduction of the barbarian Gauls into Asia where they first allied themselves with the Heracleans and later turned violently against them. Herodorus, mythographer, born in Heraclea. This page was last edited on 19 October 2018, at 03:14 (UTC).